In hookworms that infect and feed on the blood of mice, scientists have discovered a key step in blood digestion that can be targeted to disrupt the parasite's development and survival. These findings, published in PLOS Pathogens by Tiffany Bouchery of Malaghan Institute of Medical Research, New Zealand, and colleagues could help pave the way to new treatments against hookworms in humans. Hookworms are parasitic worms that infect hundreds of millions of people worldwide, primarily in developing countries. Transmitted through the skin via contaminated soil, they take up residence in the intestines, where they feed on blood and cause anemia, stunted childhood development, and complications during pregnancy. New treatments are needed to combat hookworms, and one potential strategy is to target their blood-feeding activity. From their host's blood, hookworms scavenge a molecule called heme—a molecular component of hemoglobin, which transports oxygen in the blood. Heme is toxic on its own, and many blood-feeding parasites have developed heme-detoxification mechanisms; Bouchery and colleagues hypothesized that hookworms may use a similar strategy. The researchers performed a series of experiments using a mouse-infecting hookworm species. First, they showed that it behaves similarly to its human-infecting counterparts, feeding on blood and causing anemia in mice. 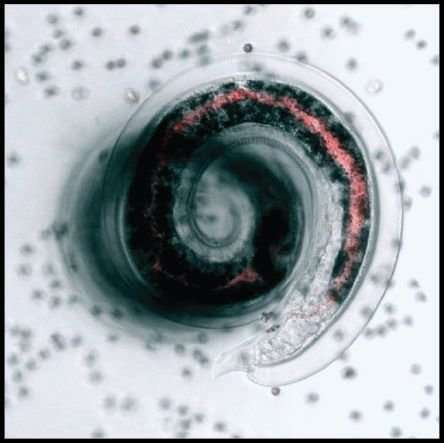 Next, they found that feeding red blood cells or haemoglobin to the hookworm fosters its growth and causes it to produce a dark brown pigment similar to hemozoin, the detoxified form of heme produced by many other blood-feeding parasites. The scientists then tested the effects of quinolones, chemical compounds that are known to disrupt hemozoin formation in malaria and schistosoma parasites. They found that quinolones likewise disrupted production of the hemozoin-like pigment in mouse-infecting hookworms, interrupting their development and their ability to reproduce. Mice treated with quinolones had significantly lower levels of hookworms, hookworm eggs, and anemia. Due to widespread drug resistance, quinolones are not a realistic weapon against human-infecting hookworms. However, these new findings suggest that development of other drugs or vaccines targeting heme-detoxification pathways could hold promise against human-infecting hookworms. The authors hope that "this leads to new opportunities to treat this most devastating of tropical diseases."